Dames n’ Games has front door valet service. Plenty of street parking and 2 self-parking lots available on Washington Blvd and across the street from the club. Private Dance Areas: Enjoy some one-on-one time with any of our beautiful ladies in the private dance area. 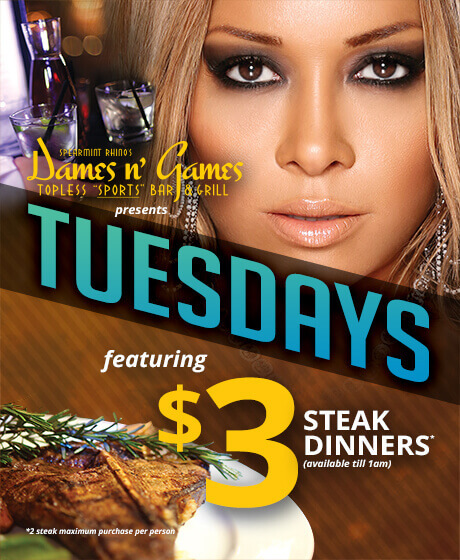 Inside Dames n’ Games is our fully loaded Sports Lounge. In the lounge are multiple flat screen HD TVs, 3 big screen projectors, a full stocked bar, and a lunch and dinner menu with delicious food. The Lounge is also soundproofed from the Main Room so you can watch and hear your sports team. Our Kitchen is open every day until 1:30 a.m. and we offer TO GO and Special Event Hosting menus as well. Also, there is special pricing on food and drinks during advertised sporting events.